The search for "healthy" and "holiday" continues at Snack Girl headquarters (AKA my house). These Santa Hats are the latest find. I was cruising around the California Strawberry Facebook page when I saw these and I thought, "Hey, I can do that!". Right about now, a good friend of mine is driving over to complain about featuring strawberries in DECEMBER. Have you looked outside your window? Mine was covered with frost this morning and it was a chilly 19F. I found these fresh strawberries in my local supermarket for $2.50 per pound and they were grown in Mexico. Mexico's climate probably allows for fresh strawberries year round. They did taste pretty yummy. It is harder to find affordable and delicious fresh strawberries in December - but, clearly not impossible. I think these are a super treat for December. In the spring, I am lucky enough to be near farms that allow me to pick my own. I thought it would be fun to take my four year old son to this activity (and he's short so I thought he would be a good picker). Santa Hats are fun to make and SO much easier than making Christmas cookies. No mixing and baking here! Just slice and add some whipped cream. I would not make them ahead for a party because I doubt they would hold together. You could use cake frosting to make them and then you would have something more stable for serving. I'm not sure they would taste as good - strawberries and cream is such a classic combination. It is a bit difficult to figure out the calorie content of this recipe. Strawberries range quite a bit in size and people can be quite heavy with the whipped cream. A strawberry has about 9 calories and a tablespoon of pressurized whipped cream in about 25 calories. Just figure 35 calories each - you get to eat THREE of these for every ONE Christmas cookie. Do you have a fast, healthy holiday dessert? Please share. Wash and hull strawberries. Slice a 1/4 inch slice on the bottom and spray 1 tablespoon of whipped cream. Place "hat" on top and dab with more whipped cream. Insert chip eyes for added cuteness. Enjoy! These are perfect for my son's 4th grade holiday party. I am in charge of bringing healthy snack so this will be perfect! I might try using a small spoonful of frozen cool whip to see if that will hold up better than the canister whip cream...will have to let you know how it works out. Thanks for sharing all of your ideas and recipes--they are always a treat! These are precious! I'm in love. We're having a big family breakfast for one of our Christmas gatherings, and I'm in charge of bringing fruit. This is a great treat for that!! For the other meal gatherings, I think i might make these with one of my other faves you told us about... your No Bake Brownie Balls... and then put that all on a red or green platter on a bed of powdered sugar "snow". (Maybe those brownies can be lumps of coal?? ha ha!!) Chocolate and strawberries... what can be better? Yum! Thank you for this CUTE idea! Soooo adorable! I am supposed to bring 2 veggie dishes to Christmas dinner at my sister's house but I may just need to bring the strawberries, chocolate chips and whipped cream to make these too! 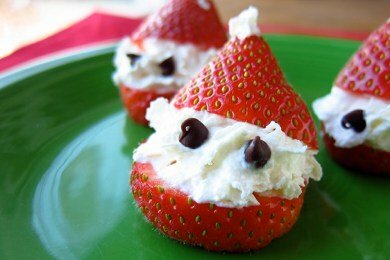 I might have to make these for our christmas party tomorrow if I can find good strawberries! Too cute!!! These are pretty cute! I disagree with the icing comment though, I think a cream cheese frosting would not only be more stable but absolutely delicious. Cream cheese + strawberries is also a very classic combination. My kids have just seen these and demand I make them! Just love the strawberries. Christmas here is a veritable fruit feast...masses of strawberries, cherries and stone fruit. Christmas in Australia may be hot but I wouldn't have it any other way. OK, so I made these today and I am so disappointed. I used the squirt whipped cream, and it didn't even last until I finished making them all! They deflated and slid and looked generally unappetizing. If I do this again, I will definitely either use Cool Whip (yuck), make my own whipped cream and make it really thick (more likely), or make cannoli filling and use that to fill them (now that's more like it! ).